Touch Ahead Software is at it again with its latest release of EquityTouch 2.6. This new and improved deal sourcing collaboration CRM has been updated to deliver the best results for managing your complex business relationships. With Multi-touch, users can now create a Touch with a Group as a participant. This means adding a Touch for a set of people or companies in one simple step. Did you hold an event where multiple companies were present? Make a note of this in a Multi-Touch, by adding the Company Group as a participant. Separate and unique Touches will be in the profile of any given member of the Group that was involved with the Touch. As opposed to the Multiple Touch Associations feature, which creates one Touch with multiple participants, Multi-Touch creates as many Touches as there are participants involved. How this helps you: Multi-Touch makes monitoring and always being aware of transactions easier than ever, and lessons the amount of entering data you have to do. Previously, the regarding company was located at the top of the Touch panel; now it is in the “Attendees” section. Users can add a company to a Touch by simply performing a search in the Company field in the Touch fly-out screen, selecting, then either clicking “Add Company” or pressing enter. Whichever company the transaction is referring to will be entered here. Users can also add an unlimited number of additional attendees to the Touch, sharing the information with the initiator and all participants. Just start typing in the attendee’s name and EquityTouch will generate the correct information. Hit “Enter” and – presto! – the Touch will appear under each attendee’s Person summary page as well as the Company’s summary page where they were employed at the time the Touch was created. 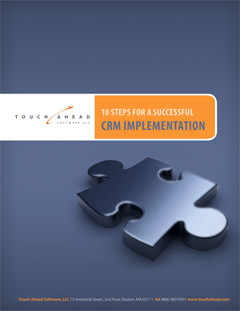 These features create a more streamlined process of entering a Touch into the CRM system. How this helps you: The new Touch Panel provides a user-friendly format that allows more options and flexibility when entering data. It also helps create a Touch that covers all necessary bases, lessening the chance of losing relevant information on any given profile. We’ve also trimmed the process down with the “Enter” feature – no need to click “Add Attendee” anymore – making it easier and faster to add Participants to the Touch. With the release of EquityTouch version 2.6 users can now add formatting to their Touch notes. Users can even go back and add formatting to old Touches in EquityTouch. Is there a particular sentence or bit of information that should be bolded in your Touch note? Want to add bullet points or numbering? It’s all there and more. How this helps you: Rich Text Touch Notes allow you to format your notes in a way that not only makes it easier for you to sort through priority information, but personalize them as well. The Outlook add-in feature will send most email formatting to EquityTouch. It will also lead to improved search results during conflict resolution. URLs will be imported and added to the Company summary page when sending a contact to EquityTouch, and if the email does not contain a “To:” address, the current user will be set as the initiator. How this helps you: The Outlook Add-in is intuitive and will lessen the amount of data entry that is required. With the latest release, current EquityTouch users can now perform an advanced search where deactivated users are a search term. The fields “Search In”, Modified By” and “Created By” now feature a “Deactivated Users” sub-menu which list all deactivated users of EquityTouch. If there are no deactivated users, only the Active users will appear. How this helps you: If someone at your company leaves – and is a deactivated EquityTouch user as a result – searching their past Touches and seeing which records they created or modified is simpler. This means work can be picked up exactly as it was left off by past employees, saving you time and energy. If you are already an EquityTouch user, check out the “New Features” fly out. This fly out will load the first time you log into EquityTouch after an update, and can be accessed at any time by clicking the link at the top of your EquityTouch page. If you’re not an EquityTouch user yet, what are you waiting for? Request a demo today! This entry was posted in News and tagged advantages, business strategy, CRM, CRM Software, CRM Solutions, EquityTouch, implementation, new features, private equity, Private Equity CRM, Private Equity CRM Solutions, release, software, venture capital. Bookmark the permalink.